Pond liner types & materials. If you would like to design and construct your own pond or water feature the chances are that you will need to chose some sort of flexible pond lining to help contain the water. This article compares the pros/cons of using flexible pond liners and the different types of materials/thicknesses available. Water Scenes supply and fit liners and geomembrane for any size pond/lake or water feature. We do not sell directly from our website as we offer a personal service that includes advice and information tailored to suit your individual circumstances from our expert geomembrane installers and technicians. 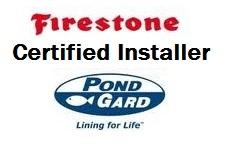 We have been trained and certified by Firestone at their HQ and are fully qualified and experienced to fit box welded liners for formal shape ponds. We weld Firestone liners on-site for larger technical lining projects; this includes lakes, large ponds and natural swimming pools to name a few. Every pond design needs to hold water and the most popular choice for home garden fish ponds and bespoke water features is the flexible pond liner. There are other methods available but they tend to be quite expensive and require specialist skills not really suitable for DIY home pond design and construction. A good reason to use pond liner when installing a garden pond or water feature is that there are no limits on the size and shape. Another bonus is that it’s probably the most cost effective way to line a pool or pond. Most flexible pond liners are made from three different materials PVC, Greenseal and Firestone rubber. There are cheaper linings available but I don’t recommend them. If you are serious about building your own pond or water feature and you would like it to last, you should steer clear. Really cheap liners will hold water, but they do not age very well and the chance of having some sort of problem is quite high. They can be difficult to repair and do not take kindly to maintenance or cleaning. Below is a small list of liners I recommend. 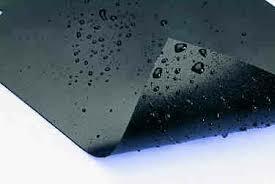 The liner materials are available from more than one manufacturer and prices can differ, so it is worth shopping around once you have made your choice. PVC pond liner, this is the cheapest form of liner I would personally use. It can be hard to work with and really requires a warm day to fit successfully. PVC is ideal for people working on a budget as it is the cheapest of the three. PVC liner can be easily repaired should you pierce or puncture the liner. It can be cleaned and maintained if the weather temperature is above 8 degrees. PVC liner tends to be quite brittle at temperatures below 8 degrees so it is not advisable that you work in or clean your pond below this. I recommend PVC liner for small ponds that can be accessed from the edge. I say this because having to get into and walk around a pond made from PVC will almost definitely cause a hole at some point in the pond liner life. SealECO (Greenseal ) pond liner, this liner is similar to the old favourite butyl. 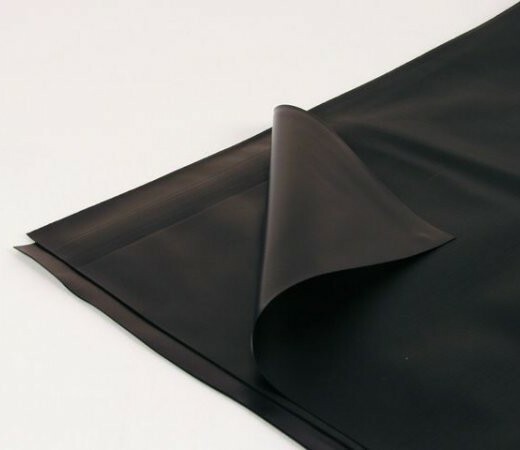 You can still buy butyl but it has now has become expensive to produce and is therefore outside the price range of what people are willing to pay for a pond liner. I champion SealECO (Greenseal), it has virtually replaced butyl as it is very similar but has a much more competitive price tag. It is flexible to use in all temperatures and easy to repair. Greenseal pond liner has a rubber like feel and appearance. It is very versatile and can be used for small garden water features as well as larger pond designs like koi ponds or wildlife ponds. Greenseal liner folds and creases very well; in my opinion it is properly the best out of the three for this. Firestone epdm pond liner, in my opinion Firestone is the king of pond liners. It is very tough and is usually only punctured by Sharpe objects. Firestone liner is the best option for large pond or lake lining projects. It’s very competitively priced, slightly more than but similar to the cost of greenseal pond liner. Firestone liner has very good elasticity and can cope with blunt objects that would otherwise pierce the other two types. This type of liner can be welded on site and there are many products available to help you do this. I would not recommend using Firestone liner on small garden pond projects as it does not fold or crease very well in confined areas. Firestone is ideal for small water features as the liner is usually hidden and less likely to leak. 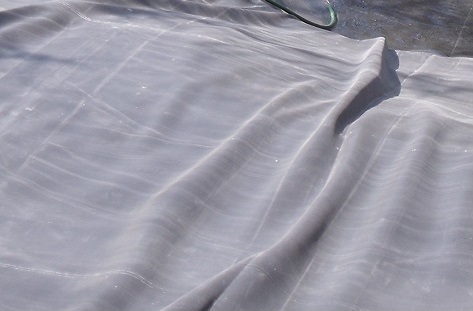 Pond liners are commonly available in three different thicknesses 0.5mm, 0.75mm and 1mm. PVC is usually 0.5mm and occasionally 0.75mm. SealECO (Greenseal) 0.75mm and 1mm. Just one final piece of advice, always use some sort of protection before laying your liner. Simply digging a hole and installing the liner doubles your chances of puncture and can be very expensive to remedy. At the very least blind the soil with building sand as this will help protect your pond liner. To find out more about pond liners check out our other articles how to fit a pond liner and how to build a pre-formed water feature.